The Bleeder Resistor is of the “last resort” option, just in case that the F1 Fuse_Switch blows open, disconnecting the main fast discharge route (via the low resistance windings of the transformer). The Discharge_Rate resistor value needs to be set to limit the discharge current, but it can not be set too low a resistance, so as not to upset the soft_start mode of operation, where charging of the capacitor bank takes place via a single diode. The relay used is a two path double throw type, co the set of contacts are mechanically syncronized and move simultaneously. On the output side, there is a bank of 12 elko capacitors, connected as a daisy-chain battery. The rectifier and filter module is powered from a separate AC winding. I need four such building blocks, as I need two sets of symmetric voltage rails. 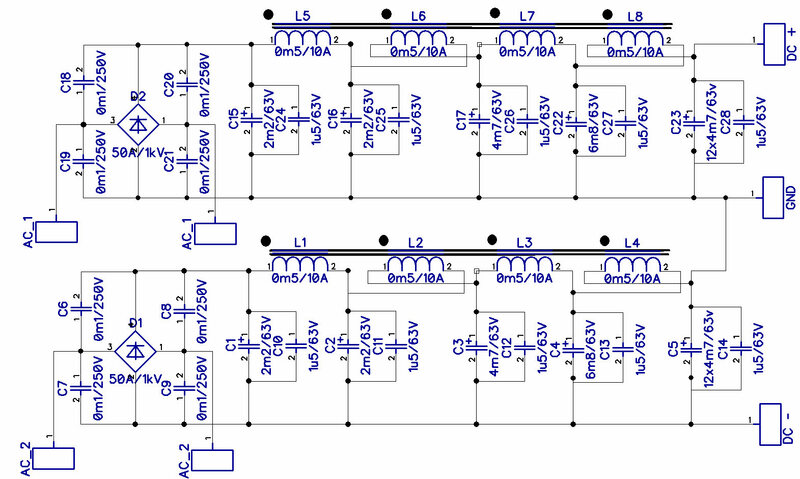 The full ”symmetric” version, providing both positive and negative voltage rails, is based on two such modules, tied together. Both modules are powered from separate AC windings (AC_1, AC_2). 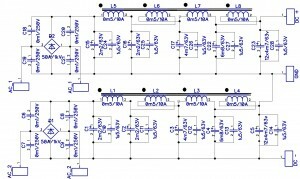 I am hoping for an output capability of 10 Amperes, 63V DC on each rail. Hard to assess the voltage drop upon full load of 10 Amperes, but I hope that it will not be too much. The interconnection wiring is made of a pair of wires, 4 mm2 and 2,5 mm2. The choke is the weakest link, as each winding is made, wound, with two parallel runs of wire, each of 1,2 mm diameter. The complete symmetrical, dual rail voltage module will consist of a cube of dimensions not exceeding 19 cm x 12,5 cm x 12,5 cm.